...the usual packing list for the Winster Cavers. So having been all quiet for the best part of 14 months, on Wednesday 25th August Etna awoke with a BANG! - just three days before our flights to Trapani. A large singular explosion took out part of the top of the Bocca Nuova crater rim, and ejected ash 1km into the sky above. There are some that think we have something of a knack for timing our visits, but volcanoes are unpredictable beasts, and as we sit here on the train, winging our way down to Luton airport, it really is a little too early to say what - if anything - will be happening when we arrive. We have a couple of nights in Trapani, before visiting Mount Etna again and a few days' stay at Hotel Corsaro. From there we return to Trapani, possibly head out to the Egadi islands, and perhaps explore some of the salt/sulphur mines in the South West. Contrary to what many guide books still say, the Erice cable car is most definitely up and running. From the East side of Trapani, it takes you on an amazing 3km journey to the ancient hill-top city of Erice a bargain at only €6 for a return ticket. Here, narrow cobbled streets are festooned with an array of shops selling typical Sicilian "ceramiche", Marsala wines, almond liqueur - plus a host of far-too-inviting places to gorge oneself. We wandered around marvelling at mediaeval buildings, ate too much, wandered some more, had a granita apiece, wandered in circles for a while and over-indulged in high-calorie Sicilian pastries. Our day was punctuated by a brief text from our friend Steve (HRH), a fellow Etnaphile, alerting us to today's ash emission from Mount Etna. Tomorrow we may get to see what's happening, but for today we just had to make do with pizza, chips and red wine under the olive trees at Andrea and Chica's place. Oh well. Erice's ancient "Castle of Venus"
A long day's drive, traversing the entire width of Sicily, partly via the Southern coastal road. We paused briefly at the Valle dei Templi at Agrigento, before heading cross-country towards Enna, and on to our favourite volcano. As we left Nicolosi and started to climb upwards, the roadside was plastered with red & white hazard tape, and signs reading "Zona Perricolosa - Vietata al Pubblico". Was this indicative of something? Was something big going off? We proceeded with excitement, and a little caution. Yet just as suddenly as they appeared, the signs stopped, and we arrived at Hotel Corsaro without incident. A brief exchange of warm greetings with Marco, and we were installed in the best room in the house - the newly refitted bathrooms, and free wireless Internet making it even better than usual! The wireless internet soon revealed that Davide has already caught on to this year's Sicily blog. We listened carefully (you can often hear any explosions at the top craters from the hotel) but all was quiet. Clearly Etna is being thoughtful, and a nice "Eruzione Turistico" is going to start tomorrow when we've got a bit more energy to climb to the top! We won't however, be going to the summit craters themselves, as the Prefecture of Catania has forbidden access to the summit craters for a period of 15 days since August 26th/27th. Rounded off the day with a splendid meal at the "Antico Orto dei Limoni" in Nicolosi - highly recommended. The "Zona Pericolosa" (danger zone) - We later discovered that the signs were for the 2010 Catania - Etna rally. Exciting in it's own right, but it's nice to think it's something even more exciting! The night-time view from room 204 down to Catania - a favourite of many Etna lovers around the world. A bright and early start plus the promise of decent weather saw us up at the cable car station trying to blag a one-way ticket for the cable car AND jeep, but that didn't work, so we resigned ourselves to parting with €15 each for the cable car only. We'd really hoped to find a (not too expensive) way to avoid doing the extra 400m of ascent to the Torre del Filosofo on foot! Still, we were able to re-acquaint ourselves with Rosario and Marco at the guides' hut to get some useful up-to-date information on the goings-on "up top". Anywhere over 2920m high (the altitude of the Torre del Filosofo) was off-limits - so strictly speaking, this meant not only the top craters, but also the jeep track round to "Etna Nord". It wasn't long though before we'd done the slog up the jeep track to the Torre del Filosofo and were tucking in to a deli feast of smoked Ricotta and mixed olives in the lee of what shelter remains there. Seeing that nobody appeared to be heading around the jeep track below the Bocca Nuova towards the North East crater, we decided to re-visit a route we had done twice previously, round to the site of the 2008 Bottoniera eruption, but managed to get all the way to the now-dormant craters this time - a very interesting route to do, and with a real feeling of remoteness. Exploring the craters on the fractures of the 2008 Bottoniera eruption - Mount Etna. Looking down the lower part of the Schiena Dell Asino ridge. After a good furtle around the craters, we cut back to the seismic monitoring station for more food and to watch the enigmatic South-East crater steaming gently for a while before heading out to La Montagnola. The clouds cleared just enough for us to be be certain of our chosen descent route via the Schiena dell' Asino, one we had done a large proportion of from the other direction but never "closed the loop" so as to speak. It proved to be a fabulous route down, though we did trudge into Hotel Corsaro at nearly 7:30pm, meaning we'd had a fairly full ten-hour day on the volcano. We certainly needed - nay, deserved - a beer after that! The indicators are, that an eruption in the near future is entirely possible. We spent most of yesterday "up top", there was no activity to be seen, and it was a long, tiring day. Graph showing overall rising trend seismic activity - taken from INGV website. The spike is Wednesday's ash emission. So given the above - what would you do? Would you wait around, watching, wondering if she's going to put on a show? Or would you spend a day doing something else, and see what's ocurring on your return? Tough decision, hey? We decided to take a trip out to the Nebrodi - a forested, mountainous area some way North of Etna, with a good reputation for some excellent walking. After some definite route-finding dilemmas of the "does the path go through the farm" variety, we opted for route-plan number two and, having convinced ourselves we knew exactly which wrong track we were on, managed a reasonable 10km circular walk with some good views back to Etna - the only real downside being the local insect life, which seemed hell-bent on having Winster Caver for its supper. DEET, it would appear, makes a good "salad" dressing. Back at Hotel Corsaro, a quick check on the INGV web site shows that the seismics are still rising, but there is no sign of activity at the top. The right call for the day, we thinks. 2nd September - Have we had a nice adventure today? Well, we didn't quite get the early start we'd half hoped for, but the plus side we managed to catch up with Davide before setting out on our (rather optimistically) chosen route. Our plan was to head up onto the Serra del Salifizio and into the Valle del Bove, returning via the Schiena Dell' Asino. We fully expected to (a) get lost, and (b) have to change our plan. Without doubt, today's plans had all the hallmarks of a potential epic. It was therefore with some astonishment that we realised we had soon managed to faultlessly navigate our way up past the Acqua Rocca and onto the ridge. The view from the ridge was, to put it mildly, awesome. We couldn't spot the routes down into the Valle - it would appear as if two significant lava flows that had ocurred in the Valle since the map we had was published meant our chosen route had fallen into disuse. A foray out along a feisty path to the top of a fine peak to the right of where we met the ridge revealed only impossible-looking descents where you were definitely going to have something go more wrong than you'd want. So - (b) the change of plan. It couldn't be that difficult to tackle the ridge up to the Schiena webcam, could it...? Well, it wasn't difficult - but it sure as hell wasn't a stroll in the park either! Definitely not one for those lacking a head for heights, this was a scramble of five-star proportions - just "out there" enough to make it thoroughly entertaining from start to finish. What a route - over 1km of airy ridge and loose scrambing, best tackled on the very top of the ridge wherever possible. And with only the vaguest trace of a path and not a soul in sight, it had a great feel of remoteness to it. We most certainly had a nice adventure today. "Non Abbandonare I Sentieri" - as if we would! With the weather being none-too-clement, and Etna still stubbornly refusing to put on the display we're awaiting, we decided the best plan was to hide underground - so armed with a bunch of GPS coordinates & cave info (kindly supplied by fellow Etnaphiles, Mr & Mrs Krabusch) we set off towards Zafferana - our first stop being Grotte dei Tre Livelli. We spotted the cave entrance as we drove down the mountainside - parked up, and started to walk the few yards back to the entrance, as a goat-herd and his dogs approached the roadside also. The dogs picked up where the Nebrodi insect-life left off, with the intention of having Winster Caver for breakfast. OUCH! A few minutes later we were back at the hotel. A quick phonecall later (thank you Davide) and we were at the Guardia Medica, with wounds sustained being carefully tended to. Not ones to be beaten by such events, we popped down to Nicolosi to pick up the prescribed antibiotics, dropped in at a bar for a quick coffee and a snack, before heading back up the mountain to resume plan 'A'. In the process we also discovered what all the "pericoloso" signs were all about - The Catania to Etna motor race / rally occuring this weekend. After all that, Grotta dei Tre Livelli, we discovered, requires a ladder & line to descend. We moved on to more cave hunting - this time with a little more success. First Grotta di Cassone, then a look at the entrance to Grotta di Case del Vescovo (ladder & line required), and finally Davide's "new" cave. Davide's "new" lava cave on Mount Etna, near Hotel Corsaro. 4th September - Rambles and raspberries - but no rumbles! Not entirely true - she's still rumbling away and the tremore are still rising, but WHERE'S OUR ERUPTION? With blue skies beckoning and silence on the tops, it would have been a shame not to drive round to Piano Provenzana to get the views of Etna Nord - Nord Est and Pizzi Deneri being crystal-clear for once, whilst down towards the coast the sunlight glittered on the beautiful hilltop town of Taormina and the ridges of the Pelitorani mountains. A one way ticket on the STAR jeep at Etna Nord is also impossible to buy, and we couldn't bring ourselves to pay €48 each for a bumpy, dusty tourist drive up and down the dirt track. It seems that one-way tickets are simply "vietato". Probably a good policy to cut down the risk of numpty incidents on the volcano, but a shame for those of us serious walkers who would appreciate the chance to make more of our precious time here. So we chose the "speleo" option again - a long walk with a lava cave as the prize for finding the right paths. We knew, of course, that there would be only us at the "Grotta dei Lamponi"....... wrong!!! Downslope in the lava tube, at a skylight, we were amazed to find a full lighting rig, cameras, and camera crew - making a film, as we shortly discovered, about the "Dance of Etna". Brief friendly chat ensued, and we were soon exploring the upslope end of the cave - remarkable for its skylights. You never can guess what's just under your feet! Mount Etna as viewed from Piano Provenzana - a lady in waiting? Inside the entrance to Grotta Dei Lamponi, Etna Nord. 5th September - Where's our eruption? A reclining sickle moon over Etna sparkling in the dawn light beckoned us to stay longer, but we had to leave today. Saying goodbye to friends old and new took some time - as these things do - but eventually we were on our way back to Trapani, stopping off for lunch at the Lago di Pergusa - a lake and nature reserve that we thought would have been greatly improved by the removal of the race track around it! Another hour and a half's drive brought us back to the Ostellino, where Andrea was waiting to greet us. 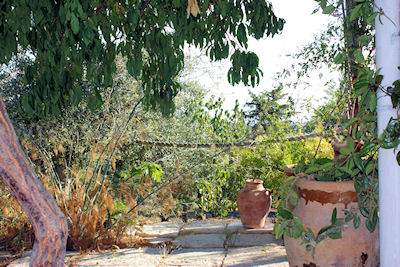 After a long drive, the only sensible thing to do was crack a couple of beers and lounge around under the olive trees... so we did just that. Plans for tomorrow are already hatching as we write. 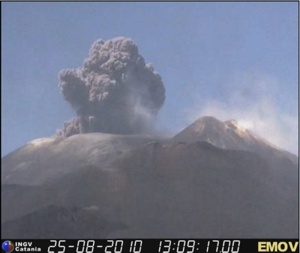 The question is, of course, if Etna starts erupting in the next few days - what to do? Stay here and accept we've missed it, or dash back across the island? What we do know, is that we can't help but keep looking - just in case! A somewhat more relaxed day found us on the small ferry to Mothia (also spelt Motya, Mozia...). This tiny little island, located in the middle of a salt-water lagoon, is a treasure-trove of archaeological remains, and ongoing exploration seems destined to fill the museum there to bursting point. We looked at about as many pieces of broken pottery as you can cope with in one day, and then took a gentle stroll around the island's perimeter, which seemed to be abundant in both archaeology, and an astonishing number of budding archaeologists. A warm, dry, and blustery wind shook the windows and the shutters at the Ostellino - the Scirocco was upon us. Yet as we breakfasted on the veranda, the sun shone brightly, and the day still had a pleasant outlook - so we made plans to walk around the nature reserve at Monte Cofano. We ambled along the clearly marked, yet almost empty paths that circumnavigate the 659m high peak, which rises up spectacularly from the azure blue sea below. The sun beat down just a little harder than your average Winster Caver is really used to, and as the scirocco gained momentum and whipped up the dusty tracks in an eye-watering fashion, we opted against the exposed-looking route to the summit of Monte Cofano, satisfying ourselves with the excellent 10km circular route and views down to the clear blue sea that had accompanied us for almost the entire walk. Monte Cofano, as viewed from Cornino, the start point for the walk." What, rain?! The weather had turned - for the better in some respects, cooler and wetter - so it seemed like a good opportunity to do some sightseeing without burning to a frazzle. The temples and ancient (6th century BC) city of Selinunte, on the south coast, were today's destination. We arrived a little nervous of what such a tourist hot-spot might bring, but our fears were soon allayed - inside the archaeological site, visitors simply vanished into the vastness of this extraordinary setting. There must be few sites of such archaeological significance as this. One cannot fail to be awestruck by the sheer size of the temples, and a thorough investigation of the whole site rewards you with unexpected fantastic views of golden beaches and turquoise coves - and of course, more temples and ruins. A truly spectacular and unforgettable day out. Whether we find time to visit the archaeological site at Segesta, included in the €9 ticket price, remains to be seen. We awoke to the tremendous roar of a thunderstorm. As we breakfasted on the veranda, rain hammered down on the roof, and lightning lit up the sky. Erice, high above, was nowhere to be seen, shrouded by a blackened sky. Maybe today was not the day to go island-hopping after all! So we opted for using the other part of yesterday's ticket to Selinunte, and drove the short hop over to Segesta, famed for another Greek temple and other remains. We were suitably impressed. The temple, which sadly never got finished, stands in a prominent position high on a hillside, almost completely intact apart from the roof. Shame really - a roof would have been dead handy today. Just managing to dodge the downpours, we walked up to the adjoining ampitheatre - upon which we were told in no uncertain terms that filming with a tripod was not allowed! "Per che?" we inquired. The answer, it would appear, is that we're just too professional. Deciding to view this as a compliment, we returned to Trapani for a stroll around the town (beautiful), and to check out parking/hydrofoil departures for tomorrow. Tonight we dine with Andrea and Chica, which will no doubt be a great evening. A view in central Trapani - an ecclectic mix of architecture. p.s. The "Tremore Vulcanico" seems to be settling out some - albeit at a somewhat elevated level, and were something to kick off now, it's probably too late go dashing back across the island. We can only assume that Etna is saving herself for the forthcoming Krabusch visit? Last night's epic electric storm seemed to have cleared the air, and having breakfasted under a clear blue sky, we made our way to the harbour at Trapani, and were soon on the "Aliscafi" (hydrofoil) to Levanzo - our plan being to do a walk in the Cicerone Guide to Walking in Sicily, and to visit the Grotta della Genovese, famed for its prehistoric cave art. Now Winster Cavers are not normally known for being tight-fisted, but having had two full days out at Salinunte & Segesta for a bargain €9, we did feel that €10 a head for a 1/2 hour visit to some old grafitti was pushing it a bit - and it may be that the (seriously overweight) lady at the ticket shop didn't advise taking the hiking trail to the cave (wouldn't have made it) - but actually, Winster Cavers quite enjoy doing that sort of thing!! So we spent our hard earned on well-earned "granite" instead, before starting off on the coast walk - and a superb walk it was indeed. A full day out with super views to the other Egadi islands, and back to the Sicilian mainland, gentle pine woods, and exposed, rugged coastline. And all the way the sun shone, but not too brightly, and a cool breeze kept the air fresh and invigorating. A great way to spend our last full day in Sicily. A view of the harbour in Trapani, Sicily.